Highlights from the newsletter. 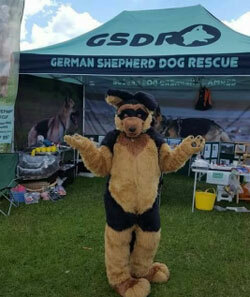 The 2018 Kirkstall festival took place on Saturday 16th July and, like always, was a great day for GSDR NE. The current total stands at £1240 however with many high- value items to be used in future events (Raffles/Santa Paws/Scratch-cards etc), this is expected to rise substantially! 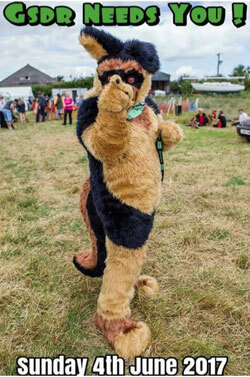 Shepfest 2018 - Our final total raised this year was £2,285.50! We were a bit concerned about the heat for such an event but after asking our local vet for advice we created a 'Cool Corner' with paddling pools, wet towels, fans, and thankfully we had no casualties. Daring Debbie Harlow chopped off her luscious long locks, raising £1000 for GSDR and donated her hair to The Little Princess Trust—an amazing organisation who provides real hair wigs for children and young adults dealing with cancer. I admit I thought she was crazy, but it looks stunning! I was contacted earlier this year by a lovely lady called Barbara whose friend Margery had sadly passed away, but she had asked her friend to ensure that her some of her money was used to help her favourite breed of dog, go to small individual charities and not fund a highly paid chief executive. Margery grew up in Aston, Birmingham where she lived behind her mums' record shop where there were always dogs in the house. When she married her husband Sam, they moved to the shop next door and ran it as a hardware shop. They had German Shepherds, usually 2 at a time and they were always in the shop with them meeting and greeting the customers. Margery herself loved people and she loved a good chat. Margery and her husband never went off on holidays because they just wanted to be with their dogs. On days off they would take their dogs to Derbyshire for lovely long walks. I spoke to Barbara and explained how our rescue was run and she very kindly agreed to donate enough money to pay 1 years kennelling fees. We are sorry that Margery passed away but know that she would approve that this would be helping her favourite breed and knowing that GSDR believes all dogs deserve a chance and not just the easy ones. We are so grateful that this came at a time when we were under so much pressure and we will make sure that all that money is used to help needy dogs. Welcome to the first edition of our newsletter for 2018 which is packed full of lovely stories and information which we hope that you will enjoy. Well, the year has started with a worrying number of dogs that need to find new homes. We were receiving rehoming forms right up until Christmas Eve and they started again in earnest on Boxing day. So far we have received 220 forms which are way over what we received at the same time last year. This, of course, does not include all the other dogs we take in from other sources such as the pounds. I have to say that many of the excuses for rehoming are becoming pathetic. We have rescued a worrying number of dogs that were either at the vets waiting to be put to sleep or were booked in to be put to sleep. Thankfully many vets now will not just put to sleep and will ask the owner to contact us or they will call us and alert us. On the plus side, during December despite the cold days our steadfast fundraisers in the North East region could be found at our partnered Pets at Homes stores supporting their Support Adoption for Pets fundraising. During the long dark days of January, the team waited with anticipation for the calls to come and collect the donations......the result is staggering. 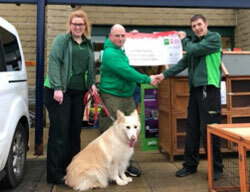 Thank you to our partnered stores at Kirstall, Guiseley, Waterloo and Clifton Moor The combined total of their donations was an amazing £7491.76! Grab yourself a coffee, put your feet up and read our February 2018 Newsletter. As we race towards the end of yet another year, time to reflect on what we have achieved and the monumental task we face as a rescue both now and going forward into a new year. Despite the number of rescues now operating in the UK, we are still seeing far too many dogs that need to find homes and the reasons for rehoming are getting ridiculous. People are buying these dogs without adequately researching the breed, they are not prepared to put in the training to teach their dog how to behave and then they use rescue to offload their problem dogs. Dogs are now regarded as commodities instead of sentient beings. Although we are getting record numbers of adoption applications, we face different problems to what we did a few years ago. People don't want older dogs, they don't want dogs with medical issues and they want perfectly behaved dogs. Many potential new owners simply are not prepared to put in any effort with behavioural issues. 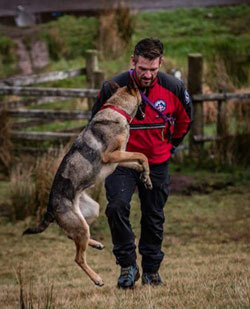 Welcome to our autumn edition of the GSDR newsletter. Well summer has been a bit of a wash out this year, it never really seemed to arrive and I was worried that it would affect rehoming, but it didn't. In August we received a record 316 adoption forms through our website, but only 80 rehoming forms which means that we have more homes than dogs. Thankfully, many of our long term kennel dwellers found homes after waiting so long although we still have a few dogs that have been in kennels over a year. September has also got off to a good start, so hopefully, we can find homes for those poor dogs that have waited patiently so long to be adopted. Well, what a roller coaster year this has been but overall we have been very busy rehoming lots of lucky dogs. We are coming up to the school holidays which may prove to be quiet as people are too busy thinking of holidays rather than adopting a new dog. It doesn't, however, stop the ever increasing flow of unwanted dogs, the numbers just never seem to go down. On a very positive note, over the last few weeks, we have seen many of our long term kennel dwellers go off to their new homes. 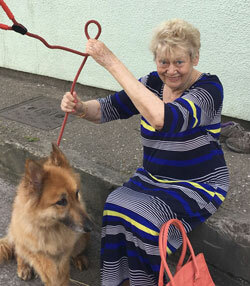 A big whoop whoop for me was old Tess who after 2 years in kennels, finally bagged herself a mom and a lovely new home. 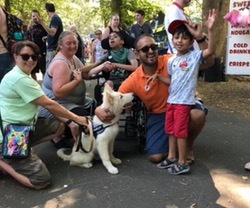 Thanks to a very kind gentleman who adopted his second dog recently and who just happens to be a producer, we will be getting regular air- time on Sky TV in between programs which will hopefully help us rehome even more dogs and raise more funds for the rescue. 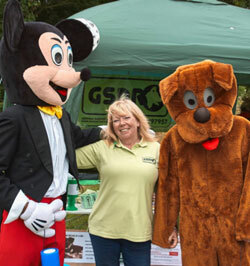 Summer is usually very busy for fundraising activities so watch out for announcements on our main and regional Facebook pages. Summer 2017 Newsletter. We do however still have far too many kennel dwellers with many of those having been in kennels six months or more. This is not the life for any dog, especially a large breed dog. We hope people will consider our overlooked dogs, all of whom have ended up in rescue through no fault of their own. They are not bad dogs, they don't have issues, they were just made homeless and we had to put them in kennels to keep them safe until new homes are found. We have now also become known for rehoming Caucasian Shepherds too and we are getting requests to rehome unwanted dogs, many of who have been abandoned and picked up as strays with unregistered foreign microchips. This is yet another breed now being exploited so we are happy to help these dogs although this is not the breed that we would ever consider putting into your average pet home. The Caucasians that we have rehomed have all gone to lovely rural homes with plenty of space for these large dogs. 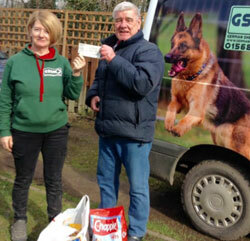 The number we have helped is a very small percentage of the total number of dogs we rehome annually. I personally have had 5 of these dogs and two of our kennels also now have experience with the breed. May 2017 Newsletter. The winter months are always hard for rescues as people tend to put off looking for a new pet until the clocks go forward and the weather improves. Having said that, after a quiet start in January, we have had a few good weeks for new adoptions. Of course, as one dog goes out, there always seem to be 2 more waiting to come in. We are as always under pressure with the number of dogs in commercial boarding kennels where they will be housed until new homes are found. Our kennel fees are still the biggest expense for the rescue, so we are grateful to all those that support us with donations. Spare a thought again for those dogs that have been in kennels for over a year now as this is not the life for any dog - they need homes. Please consider fostering for us as it is much better to place dogs in foster homes that put them in kennels where they will receive limited attention. It is also much easier to rehome a dog from a foster home than it is to rehome one from kennels as they are not stressed and we have much better idea of how well they adapt to home life. Spring 2017 Newsletter.